The search for the perfect bass drum sound is over! Now musicians everywhere can transform their drums from time-keeping devices to instruments which explode with sound at every beat with The Bass Drum Lift. This revolutionary patented lift is a must for every drummer! The Bass Drum Lift benefits 16", 18", 20", 22" and 24" bass drums. Better sound: The Lift allows the beater to strike the drum head at more desirable position. Better projection: The Lift raises the bass drum to offer more room to resonate. Double pedal friendly: The Lift affords positioning of beaters to strike on both sides of center. 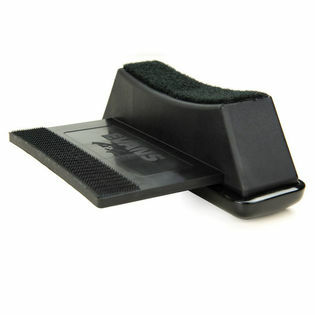 Prevents wear to hoops: The Lift eliminates the attachment of the bass drum pedal to the drum hoop. 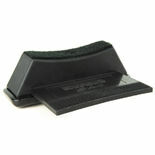 Eliminates vibration: The Lift, made of poly filled nylon, eliminates vibration to the foot pedal. Affordably priced: The Lift is priced for both the professional and enthusiast drummer. A Must For Bop Kits. Saves Bass Drum Hoop and Sets Beater In The Right Spot. Does Not Slip and Slide or Damage Drum. Great Product! I play a lot on deep pile rugs and carpets, and this lift doesn't work on such surfaces. It is very unsteady except on a hardwood or vinyl floor. A thin gig mat is OK, but not much else thicker than that. 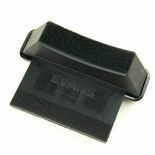 The bass drum pedal moves around and slides left-right when on any type of thick rug or carpet. My original quest was "how do I not mangle my beautiful new hoops on my lovely new Ludwigs" After lamenting that it may be the usual purchase of bass drum hoop protectors which rarely work, I came across this! it works people, I have a 24 x 20 bass drum that now sits parallel with the floor, it sings, my hoops remain untouched, nothing is gripping anything and I have to tell you, that bass drum does not move. it is a simple but brilliant idea and is something you should support, buy buy buy and thank me later! I put this on an 18' bass drum and I thought it could be a little better designed and made--the craftsmanship on this is not that great. Nothing on mine was carefully made--the bottom plastic piece was flimsy and all of the velcro and foam was taped on crooked. As far as performance, the lift is made so that you can not adjust the distance from the beater to the head. I find this very frustrating. You can only put the BD pedal on the plate and the drum rests where the rim meets the lift. It is light and handy but could use some real refinements. If you have a vintage bass drum w/o retractable spurs you need the spur extenders to make this work.